Last November, we launched Credit Karma Auto. It quickly became obvious that our members wanted to understand their vehicles better. 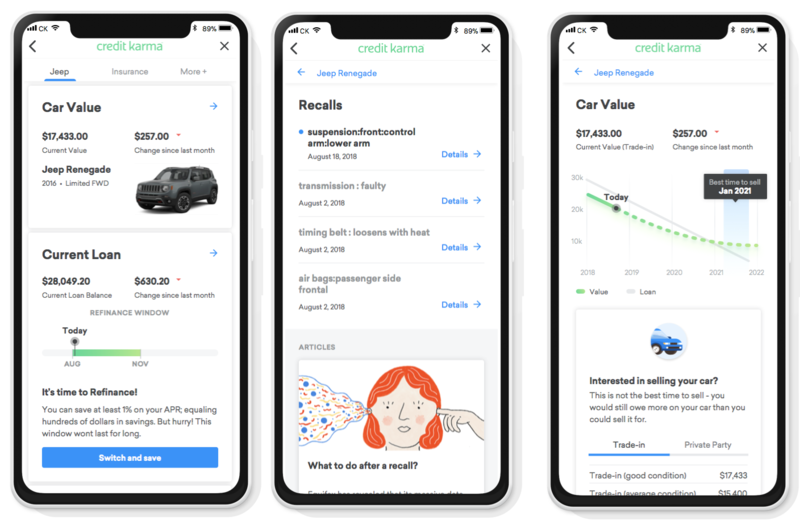 We built the entire auto experience around this insight, giving our members free access to this DMV, loan and vehicle data, directly within a new surface on Credit Karma. By adding car and driver data to our members’ profiles, we were able to build a rich and engaging experience for our members. Since launching less than a year ago, more than 8 million members have synced their car and driver data. This has allowed us to have conversations with our members about their cars, including tracking the value of their car over time, providing alerts on safety recalls, and assessing car loans and refinancing options. Features like recall alert and value tracker have resulted in astounding levels of interest, with close to 40% of auto users visiting the features every month. And we are most proud of how much money we’ve helped people save on their car loans. Millions of our members are mispriced on their car loans. In many cases, this is because the financing was arranged through the dealer, which comes with a built-in markup. What’s more, many of our members are unaware of the APR they pay and don’t realize refinancing their car loan (like their mortgage) is an option. But in less than a year we’ve helped our members save $150 million dollars on their car loans by helping them swap out their existing loan for a better one. Savings have averaged about $100 per month and $2100 over the life of the loan. But then we realized something: there’s more to car expenses than what members pay on their loans. If you’re like most people, you don’t feel great about your car insurance policy. You probably aren’t getting the best deal and likely have the wrong coverage, but shopping for insurance is really painful and confusing. You could talk to an agent, but that would require you to pick up a phone. Ah, forget it. We estimate Americans are overpaying on insurance to the tune of nearly $21 billion and we want to change that. 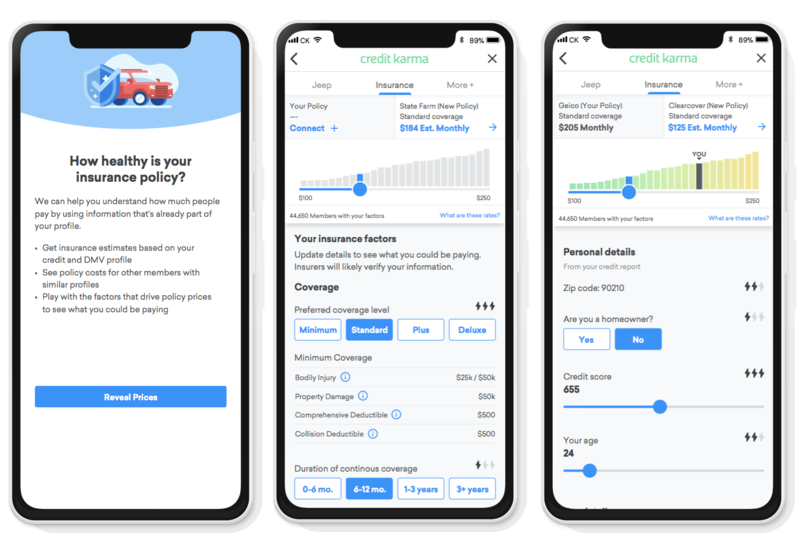 Today Credit Karma is launching a new car insurance feature to our auto center that will finally make car insurance simple and transparent. And because we are Credit Karma, you know you’ll get unbiased and objective advice you can trust–for free. By combining public insurance rate filings in your state with credit, vehicle and other Credit Karma data, we instantly show you what you could pay across the top carriers in your state. No long forms or data entry is required, and unlike many comparison sites, you’ll see brands you recognize as well as those you haven’t yet heard of, but should know. Just as we do with credit scores, we make insurance simple to learn. We show you the factors that impact pricing through a simple interface that makes insurance accessible and fun. We’ll show you pricing estimates based on other members with similar profiles. You can also see how certain changes, like speeding tickets or an increase in credit score, could impact the price of your insurance policy. Starting today, we begin this journey in California and Texas, and will roll out in other states over the coming months. We hope to bring an unprecedented level of transparency to the insurance industry. We hope to empower our members to make more informed decisions about their insurance policies — and save them money.